What can’t these powerful little berries do? Well known for being loaded with antioxidant properties, blueberries are a low calorie treat that often top the list of healthy foods. New research suggests that there may be another reason to add a little blue to your plate: blueberries may help battle diabetes and help weight loss. One study found rats who consumed blueberries, weighed less, had less abdominal fat, decreased cholesterol and triglycerides, improved glucose metabolism, and increased insulin sensitivity. There were even improvements for rats on a high fat diet, as long as blueberries were on the menu. This group of rats saw an improvement in the way their bodies use and store fat, plus an improvement in the way their bodies use glucose (blood sugar). Another study confirms that blueberries may be a key in fighting the increasing rates of diabetes. In this study, mice were given a special blend of blueberry juice. The mice lost weight, ate less, and had lower blood sugar levels. 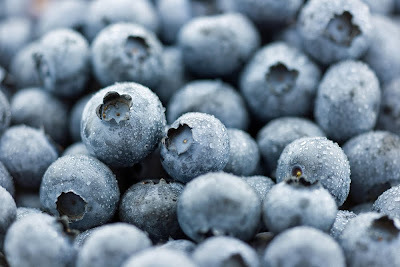 A more recent study found that blueberries helped prevent the development of fat cells. This is important because we know that it is very difficult to reduce the number of fat cells in your body. Once a fat cell has taken up residence, you can decrease the amount of fat in the cell, and if you work very hard, you can reduce the number of fat cells in your body. But it is much easier to prevent them from forming than it is to get rid of ‘em.